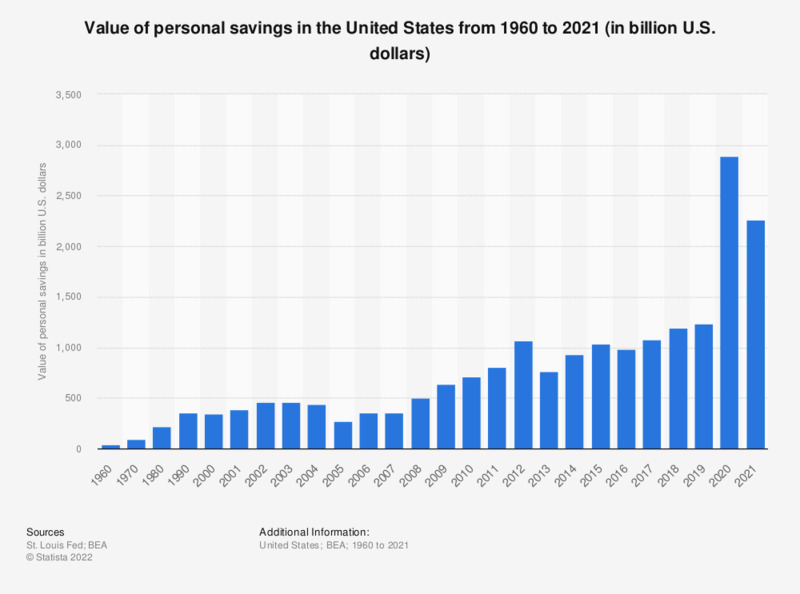 The statistic presents the value of personal savings in the United States from 1960 to 2018, as of last quarter of each year. The personal savings in the United States amounted to roughly 1.06 trillion U.S. dollars in 2018. It is generally the case that in times of austerity people hold on to capital. In the wake of the 2008 financial crisis, this has also been the case. The periods of growth and seeming economic stability in the pre-2008 crisis period were due to falling savings rates and growing household debt. People were confident the good times would stay and felt comfortable in borrowing money. Interest rates were low and credit was easily accessible and widely available - these factors encouraged people to spend money. United States consumers pushed growth at home and abroad. According to McKinsey&Company, consumers in the United States have accounted for more than three-quarters of US GDP growth since the year 2000 and for more than one-third of worldwide growth in private consumption since 1990. These trends were fuelled by the surge in household debt and spendthrift. When people change their habits in the opposite direction the economic benefits of consumer spending go into reverse. People start trying to reduce their indebtedness, spend less and save more, consumption inevitably tumbles. An increase in saving means a decrease in spending, this equates to a serious drag for any economy. The value of personal savings in the United States in 2007 amounted to 296.5 billion U.S. dollars. After the 2008 crisis the savings increased to over 600 billion U.S. dollars and reached a high of approximately 1.2 trillion U.S. dollars in 2012 before falling significantly to just over 1.05 trillion U.S. dollars in 2017.
figures for 4th quarter of each year. Which is larger: your emergency savings or your medical debt?